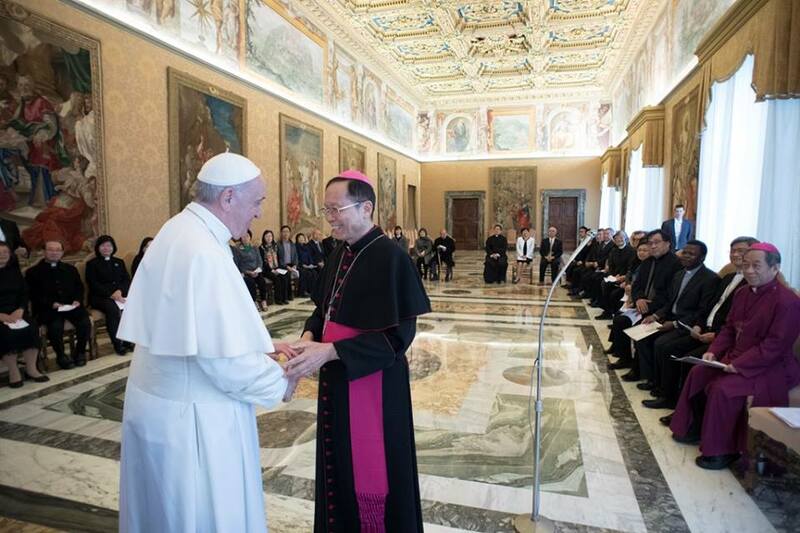 At an audience in the Consistory Hall of the Vatican Apostolic Palace, where he received a delegation from the National Council of Churches of Taiwan. As you know, I have just returned from a visit to Myanmar and Bangladesh. There I was thus able to experience the vitality and the enterprise that mark the peoples of Asia, but also the suffering face of a humanity all too often deprived of material prosperity and social well-being. There are many areas in which we, as Christians, are called to work together to promote the dignity of each human being and to support those who are less fortunate than ourselves. I am encouraged by what you have told me: “Without love, peace is not truly peace; without love, the world descends into chaos”. As Christians, we are bound above all to practice the Lord’s command: “Just as I have loved you, you also should love one another. By this everyone will know that you are my disciples” (Jn 13:34-35). The love of God, made incarnate in life, is thus our royal road, and the basis of our common responsibility before the world to account for the hope that is in us (cf. 1 Pet 3:15). The Catholic Church, through the Chinese Regional Bishops’ Conference, has been committed, from the establishment of the National Council of Churches of Taiwan in 1991 to promoting greater unity between believers in the Lord. The strengthening of relations between the Christian confessions, and the shared proclamation of Jesus, also through works of charity and educational projects aimed at the young, will prove beneficial to society as a whole. Building a better future for all requires, in a particular way, educating the younger generations in the art of dialogue, so that they can become protagonists of a much-needed culture of harmony and reconciliation. This will encourage them to pursue, with God’s help, the path that leads from conflict to communion, a path that has shown itself so fruitful in the ecumenical journey.